Earlier this year, our CEO Nikolas Kairinos took part in HolonIQ’s Global Executive Panel to discuss the use of artificial intelligence in education. Long-heralded as a hotbed for AI innovation, the education sector is prime for disruption from advanced technologies such as machine learning and natural language processing. After all, AI is ultimately concerned with improving cognitive functions such as perceiving, reasoning, learning, and problem-solving – if applied correctly, it could create a wealth of new possibilities for people around the world to educate and be educated. Indeed, that’s why Fountech is committed to the Soffos project, which will develop efficient and democratic AI technologies to help people learn more effectively. The Global Executive Panel consisted of 377 AI experts, and HolonIQ has this month unveiled the key findings. Generally speaking, the panel saw huge potential for AI in education. 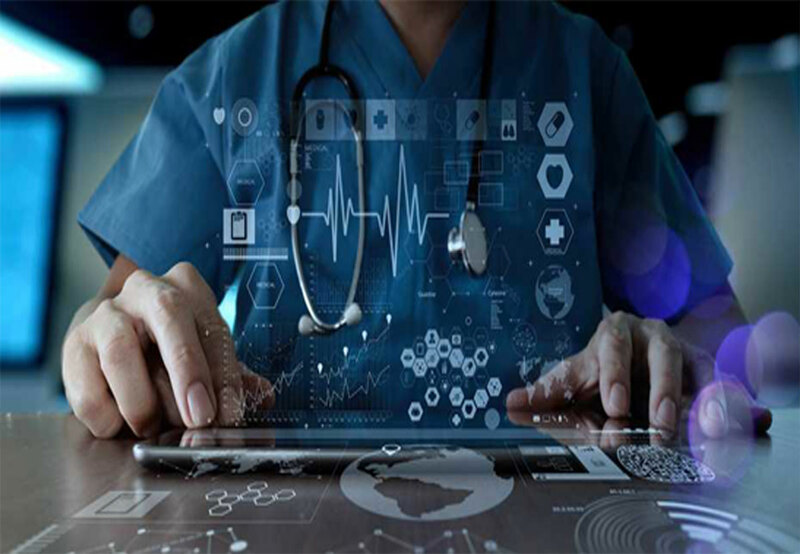 However, it’s still early days for this technology; only one in ten of the panel’s organisations have deployed AI, nearly a fifth have completed a pilot and a third have no action planned. The challenges currently faced by organisations in the education technology (EdTech) space include a shortage of talent, a lack of a clear strategy, insufficient data and poor leadership commitment. These challenges are not unique to AI; most new technologies face similar barriers to adoption. The result is that many organisations – both those developing AI and educational institutions themselves – are still in the ‘planning’ phase. Of course, grouping the wide range of technologies that fall under the AI umbrella into one catchall term can be somewhat reductive. In reality, when one moves from industry to industry, the specific AI tools that deliver value vary greatly. According to the global panel, ‘vision’ and ‘hardware’ AI applications are deemed less useful (judging by adoption figures) than ‘algorithm’ and ‘language’ tools. Exactly what form AI disruption takes within the education sector remains to be seen – such is the pace of innovation in the AI field, it can be difficult to accurately forecast exactly how the technology will be applied to deliver value in the future. Nevertheless, the potential in this space is vast. 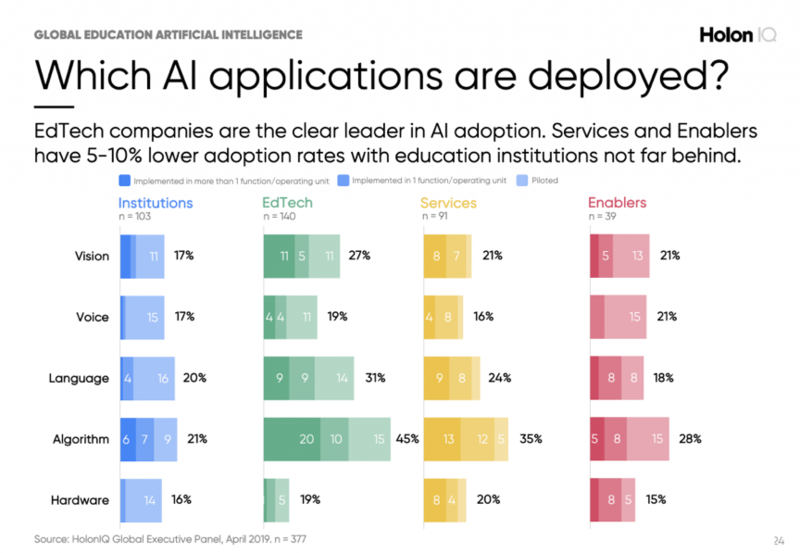 In fact, of those who had deployed some form of AI solution for educational purposes, 80% said they have seen value come from it, with 40% saying the deployment had delivered ‘significant’ value. Returning to the Soffos project, our goal is to enable learning through AI. Traditional teaching methods have not changed in decades, and antiquated school teaching systems offer little chance of preparing anyone for the current rate of technological progress, often leaving the learner unable to fulfil his or her potential. Soffos will offer advanced interactive technology, virtual reality and AI that will allow rapid progress for learners. Imagine an education system where we reward learners’ competencies and achievements by actively recognising and encouraging it, rather than marking people down using stultifying grades. 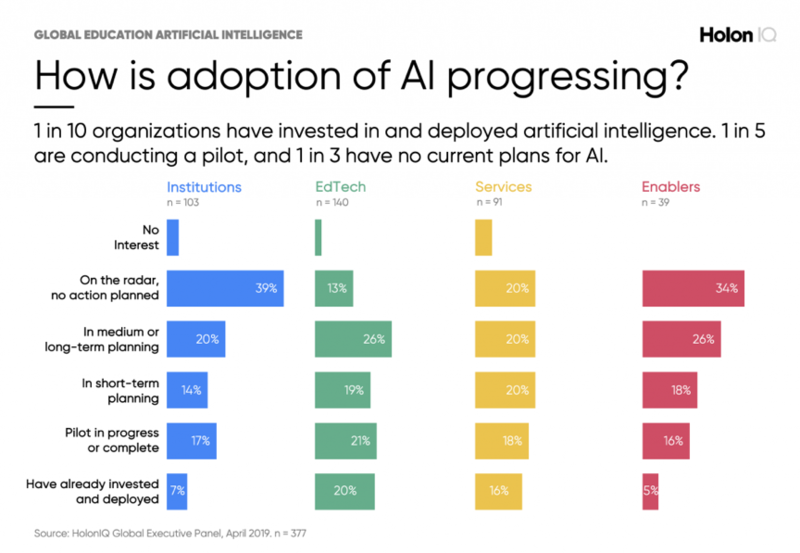 The future is bright for AI in education, but evidently there is a lot of progress yet to be made. Fountech is excited to be at the forefront of this journey and we are committed to driving progress to ensure people in the future have a better way to learn.